Meatballs don’t have to always be married to pasta. There is more than spaghetti and meatballs and this little Mediterranean inspired meatball proves it. Salty feta and a wee bit of sundried tomatoes equals a meatball full of fabulous flavours that doesn’t need sauce or a high carb pasta to make a statement. Excellent as a cheeky little appetizer or accompanied by roasted veggies and a spinach salad. 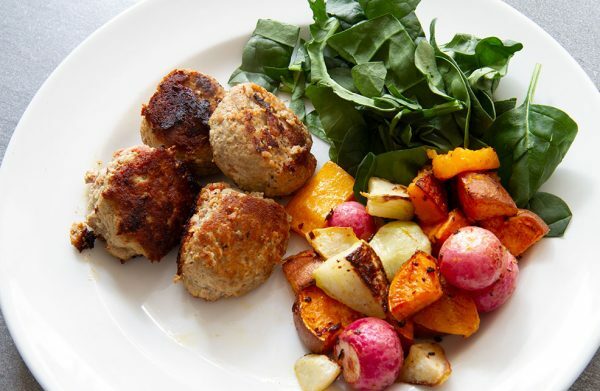 This mighty meatball is low in carbs and high in protein. Takes only a few minutes to construct then cook them slow and low so they get cooked through without burning them. Combine all of the ingredients (except olive oil) in a medium bowl. Using your hands mix until well incorporated. 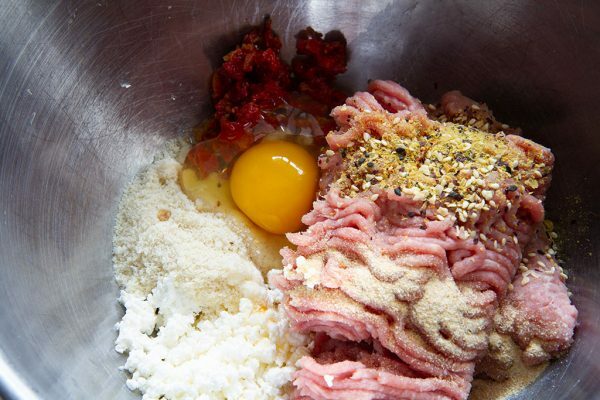 Form 16 meatballs and put aside. Warm olive oil in a large frying pan. Place meatballs in hot oil being careful not to overcrowd the pan. Cook for about 5-7 minutes on medium, covered. Turn meatballs over and cook for an additional 5 minutes or until golden brown and cooked through. Remove from pan and serve hot with your favourite side dish our sauce. Enjoy!